What Is VA Form 10-0137? VA Form 10-0137, VA Advance Directive: Durable Power of Attorney for Health Care and Living Will - or the VA advance directive form - is a Power of Attorney (POA) form used by the Department of Veterans Affairs (VA). 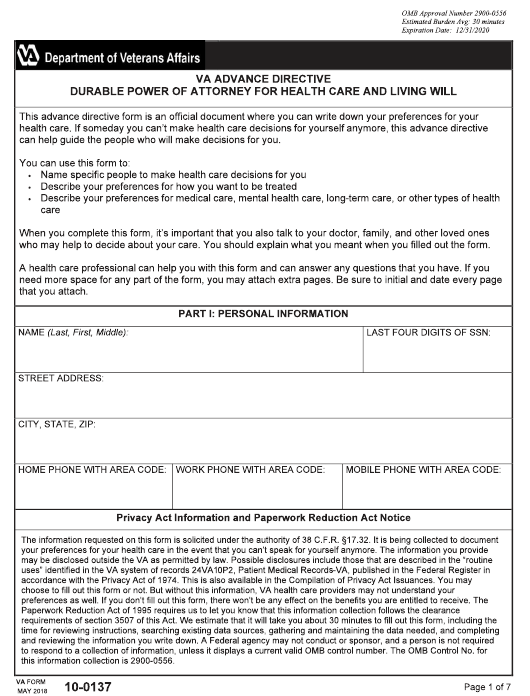 This form is used to designate a health care representative that will be able to act on behalf of the person in case they will no longer be able to make decisions themselves. The information provided on this form can be changed or canceled anytime, as long as the individual is well and of sound mind. The latest version of the form was released by the VA in May 2018 with all previous editions obsolete. A fillable VA Form 10-0137 is available for download and filing below. Alternatively, a printable version of the form can be found through the VA website. This form has an equivalent in Spanish - VA Form 10-0137, Directrices Anticipadas De Va Poder Legal Para La Designacion De Agente Para El Cuidado De Salud Y Testamento En Vida. How To Fill Out Va Form 10-0137? Where To Mail Va Form 10-0137? Part I, Personal Information. Enter your full name, last four digits of your social security number, full address and home, work and mobile phone numbers. Every page of the form must contain your full name and last four digits of the SSN. Part II, Durable Power of Attorney. This section is for appointing a specific person to make healthcare decisions for the individual when they are no longer able to do so. This person is referred to as a health care agent. This person should be aware of the individual's values and choices regarding their health care. The individual can name two healthcare agents. The form requires their full names, addresses and home, work and mobile phone numbers. Part III, Living Will. This section is for indicating the preferences in case the person is unable to make healthcare decisions anymore. Section A of this part is for indicating preferences for life-sustaining treatments, including the CPR, mechanical ventilation, kidney dialysis, artificial nutrition, and hydration. Section B is for listing preferences for a severe mental health condition. Section C can contain additional preferences. Section D is for specifying, how strict these preferences should be followed. Sections B and C are optional. Part IV, Signatures. This section is for signatures: the signature of the individual and signatures of two competent witnesses who personally witnessed the signing of the advance directive. Both witnesses should be present when the individual signs the form, know them personally or be shown proof of their identity before signing the form. A health care agent of the individual cannot be a witness. Part V. The form should be notarized in order to be legally binding outside the VA health care setting. The completed copy of the VA Form 10-0137 should be presented in person or mailed to the individual's VA health care provider for medical records. Provide your health care agent with a copy, as well as and any person who is involved in the individual's healthcare decision. Keep the original of the completed form for your records. VA Form 10-0137A, Your Rights Regarding Advance Directives is a form outlining two types of advance directives, and legal rights and responsibilities relating thereto. VA Form 10-0137B, What You Should Know About Advance Directives is a document containing answers for frequently asked questions about advance directives.